July 13, 2012 - The Federal Aviation Administration (FAA) has proposed a civil penalty of $13.57 million against The Boeing Company for failing to meet a deadline to submit service instructions that would enable airlines to further reduce the risk of fuel tank explosions on more than 380 Boeing jetliners. "We are committed to ensuring the safety of the flying public," said U.S. Transportation Secretary Ray LaHood. "Manufacturers must provide the necessary instructions so the airlines can comply with this important safety regulation." "We take this matter very seriously," said Acting FAA Administrator Michael Huerta. "We have issued hundreds of directives to eliminate fuel ignition sources over the past 16 years, and this step will add another layer of safety." Following the TWA 800 accident in July 1996, the FAA has issued 283 directives to prevent the ignition of vapors in and around commercial aircraft fuel tanks. On July 21, 2008, the FAA published the Fuel Tank Flammability Rule, which required manufacturers to develop design changes and service instructions for installing systems to further reduce fuel tank flammability. The rule gave the two companies that design affected aircraft until Dec. 27, 2010, to submit service instructions for FAA approval. The FAA alleges that in January 2010, Boeing committed to provide the instructions by the deadline. 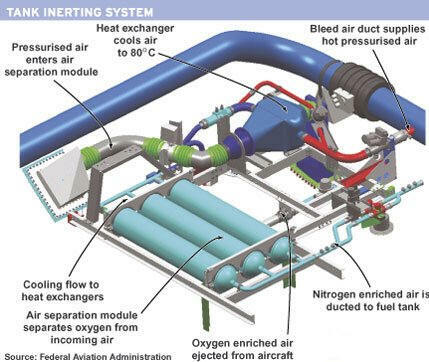 The instructions were to explain how to install systems that would replace the oxygen in airplane fuel tanks with non-flammable nitrogen gas, reducing the risk of explosion. Boeing missed the deadline for submitting service instructions for the 747s by 301 days, delivering them to the FAA on Oct. 24, 2011. The company was 406 days late in submitting service instructions for the 757s. In total, 383 U.S.-registered Boeing aircraft are affected by these delays. Airbus, the other manufacturer required to develop instructions for retrofitting certain models of its airplanes, met the Dec. 27, 2010, deadline. The Fuel Tank Flammability Rule requires airlines to retrofit half of its fleet by 2014, and complete the retrofit by 2017. An airline trade group has proposed an extension of those two dates because of the service instruction delay for certain Boeing aircraft. The FAA expects that most, if not all, operators will meet both the 2014 and 2017 deadlines, even if they received service instructions later than anticipated. The FAA has advised the trade group that the agency is not considering any extensions to the 2017 deadline for completing the fleet retrofit. However, the agency will consider extending the 2014 deadline if necessary, based on the specific circumstances for a particular operator. The total amount of the proposed civil penalty against Boeing is $13,574,400. Boeing has 30 days from the receipt of the FAA's enforcement letter to respond to the Agency.